The Adventure Kids travel to Ireland and visit the Waterford Visitor Centre where we learned the art and science of blowing and cutting glass from the Waterford Master Craftsmen. Making crystal may be an art and a science but it is also somehow a magical process when you consider that crystal is made from molten silica sand, litharge (lead oxide which gives crystal its weight and sparkle), and potash that comes to life when the "wizards," or in this case, the Master Craftsmen transform the raw materials into sparkling crystal. In September 2007, we visited the Waterford Visitor Centre to learn about the history of the famous crystal with the seahorse logo. Founded in 1783 by brothers George and William Penrose, today Waterford crystal is renowned worldwide for its excellence and quality. One of the best ways to learn about a craft is from Master Craftsmen and to accomplish this, we arranged for a private VIP Tour with Mr. Louis Flynn, Visitor Centre Marketing Manager, Waterford Crystal, to watch the Master Craftsmen at work, and to also try our hand at blowing and cutting crystal. After watching an informative video, we began our "apprenticeship" with a stop in the wood shop where the craftsmen make jointed wood molds for the trophies and other special pieces, which the crystal blowers use to give shape to the pieces. The wood molds have a life expectancy of about 1-1.5 weeks, after which they are reused to stoke the furnaces. For regular production pieces, the blowers use durable cast iron molds. Waterford creates trophies for the world's most illustrious events and ships them worldwide, which sparked our curiosity on how they prepare for possible breakage. Mr. Flynn assured us that when Waterford creates a custom trophy they actually create 3 trophies; 1 trophy is half finished, and 2 are completely finished. They send the first trophy, followed by a second as a "just in case," which is returned after the event if it is not needed. Next stop on our educational journey was watching the Master Blowers at work. A crystal cylinder comes down a conveyor according to a timer, and is then placed in a glowing red-hot 423° Centigrade furnace to heat the cylinder, which transforms it into a ball and it is attached to a long metal rod. 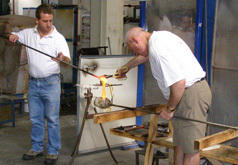 The master blower removes the rod with the crystal ball from the oven and uses a wooden ladle-like form to help shape the ball, returns it to the furnace to heat it again, and then finally returns to his workspace where he will start the blowing process. This complicated procedure requires skill, patience, and the ability to turn the rod throughout the process, pausing to blow short breaths of air into the rod, which flows into the crystal causing the ball to expand and form a bubble. Using the wooden shaper, and also blowing the crystal into the cast iron mold, the object starts to come to life. We were totally enthralled as we watched the Master Jugmaker, create a crystal jug with the assistance of his 4-person team. Each person plays an important role in the team, and great care must be taken when the handle is attached to the jug, as molten crystal has the consistency of honey and is very runny. We moved on to watch another Master Blower and his team at work, and Mr. Flynn decided that we were now ready to learn the art of blowing crystal. We decided that (Debra) would be the guest "crystal blower" to work with John, the Master Blower. It was a bit intense standing beside John in front of the furnace, waiting for the crystal to heat. When John deemed that it had reached the optimum temperature, he removed it from the oven, and I assisted him in the shaping process before we returned it to the oven. Next came the blowing process, which required that I very gently provide steady breaths all the while rotating the metal rod, which was a bit tricky to maneuver. As my crystal bubble grew large and very round, I could not believe my eyes, I had done it! I had blown my first piece of crystal! 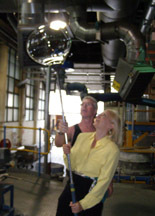 I happily posed with my large, round bubble, which would later be broken, heated and reused, as Waterford does not allow any less than perfect pieces to leave the factory floor. As we walked to our next lesson, to watch the Master Cutters, Mr. Flynn told us that Waterford produces 25 tons of crystal each day with continuous 24-hour operation 7-days per week. The cutters must memorize 200 patterns, and each cutter can cut 100 wine glasses in an 8-hour shift. We met with Tom Power, a Master Cutter who has worked at Waterford for the last 39 years beginning his apprenticeship at 15. We watched as Mr. Power cut the famous patterns onto crystal bowls and were amazed once again at the skill level and preciseness that it takes to cut the bowls using a revolving wheel. Edward: After instructions on what was required of us, I donned a white laboratory jacket and with some assistance from Mr. Power, I made the fist cut on the side of the bowl. My task was to make cuts on the bowl following the black lines that acted as guidelines. With intense concentration and steady hands, I made the cuts and then scored the bottom of the bowl to create a star. Mr. Power would later finish cutting the pattern on the bowl leaving an open space around my side cuts to allow for engraving, which would read "Cut By Edward on his visit to Waterford Crystal September 2007." It was now (Debra's) turn to have the experience of cutting crystal. Debra: I must admit that I had some trepidation about approaching the wheel and cutting the crystal, as I envisioned myself cutting it too deeply or worse, shattering the bowl. Mr. Power put my mind at ease as I approached the wheel and slowly made the first cut. I survived, and so did the bowl, so I continued, each time getting a little better, of course since the first cut was not all that great, I had no where to go but up as they say. The side cuts were difficult, but when I made my cuts on the bottom and hit each of my required marks, I was overjoyed. Mr. Power would also finish cutting the pattern on my bowl, as well as sign his name and date, polish the bowl, and ship it to me in a few weeks. I could not wait for my bowl to arrive reading, "Cut By Debra on her visit to Waterford Crystal September 2007." Naturally we had to compare our cuts on the bowls having a small competition between ourselves as to who made the best cuts, although Mr. Power and Mr. Flynn wisely proclaimed that both of our bowls were wonderful. Our bowls may be a bit imperfect, but they are truly ours, and commemorate our adventure at Waterford Crystal, which was truly a luxury experience. On a high after our cutting experience, we were off to visit the Master Engravers and met with Mr. Pat Brophy who has worked at Waterford for 33 years and watched as he used a small soft copper wheel tool to gently scratch the surface of the crystal. We also met Sculptor Pamela Power to learn how sketches are transformed into custom designs, and also met Master Artisan Sean Egan to learn about his very touching 911 tribute crystal sculpture which took him over 200 hours and 6 months to complete. So, do you think that you have what it takes to work as a craftsman at Waterford? To begin with, you must complete a 5-year program as an apprentice craftsman, it then takes another 3 years apprenticeship to become a master, followed by another 2 years to become an engraver, so the road to perfection is indeed a labor of passion and of love, as well as a lifetime career. 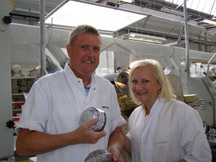 We had spent an exciting morning at Waterford Crystal and we had not yet even visited the gift shop! After lunch in the Waterford Visitor Centre restaurant, we were off to do some shopping in the gift shop where we learned that the Lismore pattern, based on a design of Lismore Castle, is still the most popular pattern after 52 years, and is the number one pattern on bridal lists in the United States. Another thing that we learned is that Waterford does not sell "seconds," they only sell the best, which is no wonder why Waterford Crystal has retained its worldwide excellence for quality. Many of the items in the gift shop are only available at Waterford in Ireland, there are special in-shop promotions, and they ship worldwide, which was all the inspiration that we needed for doing some indulgent shopping. Luxury Experience would like to extend a huge thank you to Mr. Flynn and the Master Craftsmen who acted as our teachers and made our visit to Waterford Crystal a most memorable experience. 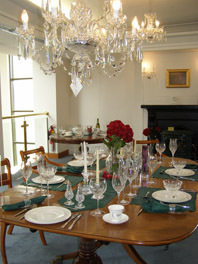 For information on Waterford Crystal and the Waterford Visitor Centre, please contact them for tour hours, admission prices, and to book group or special VIP tours. Special needs facilities are available, as are multi-lingual tours. Please read other articles on Ireland in the Destinations, Hotels and Resorts, Restaurants, Chefs' Recipes, Spas, Liquor Cabinet: Celtic Crossing Liqueur, Boru Vodka, Knappogue Castle Irish Whiskey, Fashion, Adventures and Luxury Products sections.